It seems we´ve been getting “richer” over time. 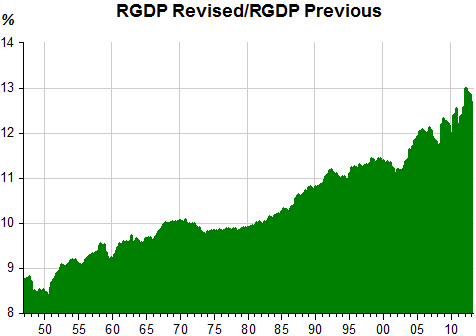 The chart shows that the revised GDP has been getting proportionately higher. 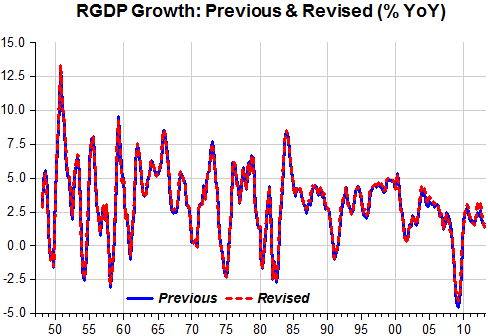 But the rate of growth has not changed in any significant way. 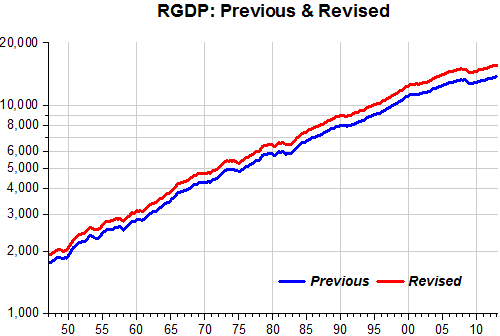 Basic growth statistics over the 1947 – 2013 interval. The Fed is unlikely to make any larger moves in part because little has changed on the economic front since their June meeting. Finally, while it isn’t the Fed’s formal policy to only make big policy moves at meetings featuring a Bernanke press conference, the reality is that the committee has tended to save big announcements for meetings after which Mr. Bernanke can take to the microphones to offer further explanation. That´s cute but easy to solve. Just have a PC after every meeting. The point, nevertheless, is that PC´s have caused damages. Just look at May 22 and June 19. Maybe they should be scrapped? Consider post 2007 US monetary history. The Fed promptly took the policy rate to zero. We still had big problems. So the Fed started QE. We still had big problems. So the Fed did further rounds. We still had big problems. So the Fed tried forward guidance. We still had big problems. So the Fed tried outcome-based as opposed to calendar-based forward guidance. Guess what? We still have big problems (I know, counterfactuals are a b**ch, but the Fed clearly didn’t fix things). You may say, “but recoveries after financial crises are always slow”. But people, that’s just another way of saying that Central Banking is not that powerful when it’s most needed! You may say, “but they should have done more and that would have fixed things”. That’s borderline epistemic closure. “The right monetary policy can do anything. The economy is not fixed, so the right monetary policy was not employed”, is going to be pretty hard to ever disprove. It´s not a question of “doing more” but doing differently. Angus is really a slave to what Christy Romer called “The Most Dangerous Idea in Federal Reserve History: Monetary Policy Doesn’t Matter”. As to “The economy is not fixed, so the right monetary policy was not employed”, is going to be pretty hard to ever disprove” is not true because that´s exactly what FDR did in March 1933, even if his other mistakes held things back. Central bankers who dismiss monetary policy effectiveness off hand have no place being central bankers. Note, for example that the “Great Inflation” went on for more than a decade. During seven of those years Arthur Burns also thought monetary policy was powerless to restrain the inflation that raged on. After all, it was due to supply side (or real) factors – unions, oligopolists, etc. Funny, isn´t it, that monetary policy can neither constrain aggregate demand nor increase it (or keep it on a stable path)! If it can´t do anything, drop it from the textbooks and never mention the words again. 3. The fact that austerity appears to have been self-defeating in the euro area while the most rapid fiscal consolidation since the Korean War demobilization in the U.S. has been met with steady growth is a critical testament to the fact that the Fed has been more adept at offsetting demand/velocity shocks than the ECB. 4. 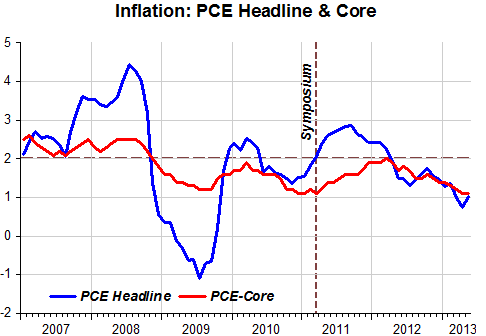 Hard money critics of QE predicted, quite wrongly, runaway inflation. Alternatively, those in the liquidity trap Keynesian framework have asserted fiscal dominance at the zero lower bound (ZLB) on short rates and that monetary base expansion is essentially powerless. If this were true, however, the U.S. should be back in recession. Instead, the average pace of job growth in 2013 is running slightly ahead of last year’s average despite the sharpest three-year fiscal consolidation since the Korean War demobilization. But QE is not a permanent solution because central bank balance sheets cannot increase indefinitely. Nevertheless, having tasted the power of monetary policy in ‘reviving’ a moribund economy, it is high time to make NGDP an explicit target. Pity that Japan didn´t break with tradition, stipulating a 2% inflation target. The BoE is apparently following a sequence that Mark Carney talked about last December of, first, establishing forward guidance with thresholds and if that doesn´t do the job (which it won´t), change the target. 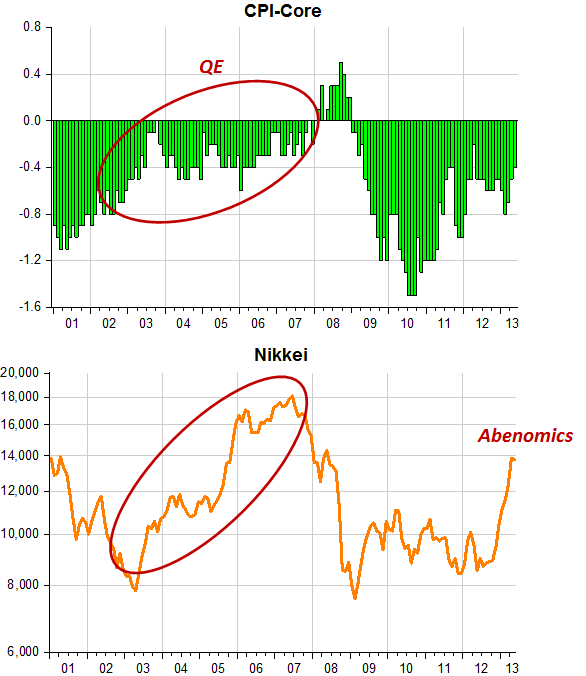 “Abenomics is working,” says Klaus Baader, from Societe Generale. The economy has roared back to life with growth of 4pc over the past two quarters – the best in the G7 bloc this year. The Bank of Japan’s business index is the highest since 2007. Equities have jumped 70pc since November, an electric wealth shock. “Escaping 15 years of deflation is no easy matter,” said Mr Abe this week, after winning control over both houses of parliament, yet it may at last be happening. Prices have been rising for three months, and for six months in Tokyo. Department store sales rose 7.2pc in June from a year earlier, the strongest in 20 years. My view is that Japan is less sclerotic and pre-Thatcherite than often claimed. The Western narrative that Japan kept zombie firms alive and put off reform after the Nikkei bubble burst in 1990 is only half true. The greater failing was monetary policy. Yet the real crisis is demographic, and harder to solve. This will be Mr Abe’s real test. But without a monetary revolution, he could never even have started. NYT: A couple of slightly different topics. On the economy, the Fed is obviously an important player. You’ve got a big decision ahead of yourself in terms of the chairman. What are you looking for in a chairman? And there were reports yesterday that you are very close to naming Larry Summers as the new Fed chairman. True? MR. OBAMA: And what I’m looking for is somebody who understands the Fed has a dual mandate, that that’s not just lip service; that it is very important to keep inflation in check, to keep our dollar sound, and to ensure stability in the markets. But the idea is not just to promote those things in the abstract. The idea is to promote those things in service of the lives of ordinary Americans getting better. And when unemployment is still too high, and long-term unemployment is still too high, and there’s still weak demand in a lot of industries, I want a Fed chairman that can step back and look at that objectively and say, let’s make sure that we’re growing the economy, but let’s also keep an eye on inflation, and if it starts heating up, if the markets start frothing up, let’s make sure that we’re not creating new bubbles. That sounds much more like Summer than Yellen! What you gather from the interview is that the inflation mandate trumps the employment mandate at least 3-1! Friedman’s money supply rule soon proved itself inadequate, but a more flexible kind of monetarism — one that still left no role for fiscal policy — did end up ruling conventional wisdom from the mid-80s to 2007, the era of the Great Moderation. Then came the Great Recession, the Fed funds rate came up against the zero lower bound, and we were banished from the monetarist paradise. In fact, as I’ve written on a number of occasions, recent experience pretty conclusively shows that Friedman’s claims about how easy it would have been to avert depression were all wrong. 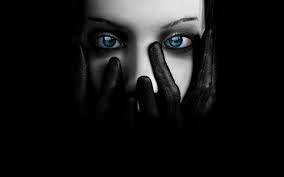 Still, QE, in the eyes of its most enthusiastic advocates, can return us to Milton’s Eden. And they are determined to read the evidence as confirming that hopeful notion. Yet there are many economists, myself included, who regard this view as highly unrealistic, yet support more aggressive Fed action all the same. Why? First, because it might help and is unlikely to do harm. Second, because the alternative — fiscal policy — may be of proven effectiveness, but is also completely blocked by politics. So the Fed’s efforts are all we have. PK supports monetary policy because it´s a placebo. It can do no harm and, who knows, ‘psychologically’ it might help! Imagine if FDR thought the same in early 1933. He probably wouldn´t have thought delinking from gold would be worth the trouble! As the charts (reproduced from the previous post) indicate, Friedman was right to claim how easy it would have been to avoid the depression, given how easy it was to turn the economy around. Today, on the other hand, we are content with remaining ‘depressed’. And what about the “proven effectiveness of fiscal policy”? 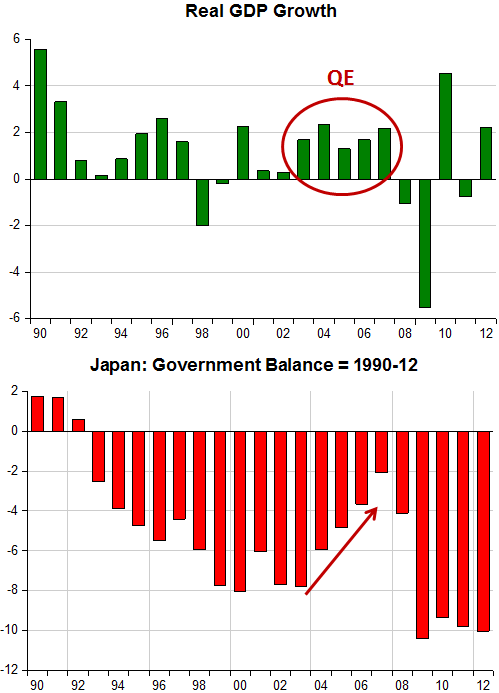 The charts show that while between late 2007 and 2009 the deficit more than quadrupled, employment tanked (Note that when QE1 came online the rate of fall in employment was reduced) and in 2010-13, while the deficit was almost halved employment increased consistently (less than what would be desirable because monetary policy is still keeping the economy depressed). But to PK acolytes, he can never be wrong! “None of the U.S. expansions of the past 40 years died in bed of old age,” MIT economics professor Rudiger Dornbusch famously observed in 1997. “Every one was murdered by the Federal Reserve.” Researchers tend to agree, as shown by numerous studies that link inverted yield curves with economic contractions. But does the history of the business cycle and monetary policy in the decades prior to the Great Recession of 2008-2009 still resonate today? In other words, what are the odds that the next recession will be a byproduct of monetary policy decisions, intentional or otherwise? I’ve been running such questions around in my head for a while, pondering why and how the business cycle could make another trip to the dark side. There’s minimal risk on that front at the moment, as last week’s review of indicators suggest. But assuming that the business cycle hasn’t been repealed (a reasonable assumption, to say the least), we’ll see another downturn one day. But given the Fed’s extraordinary efforts of late in keeping that risk to a minimum, is the probability of a new recession lower than it might otherwise be? All of which brings us down to the real question: Can we have a recession if the Fed is keenly focused on keeping one at bay? No one really knows the answer, in part because the Fed has often been a key factor, perhaps the leading factor, in causing recessions. But this time really could be different. I find it interesting because to my mind they are looking in the ‘wrong direction’. The economy is in a depression, so what he´s wondering is if we´re going to go in deeper! The real worry should be “when will we go back to a ‘decent’ level of economic activity”? The parallels with the 1930s are striking. In early 1933, when he took office FDR was clearly worried about getting the economy back to a higher level. To that end he proposed targeting the price level (take it back to the 1929 level). The economy, which had fallen much deeper than today, reacted, but in 1937 monetary policy again threw the economy down the chute. 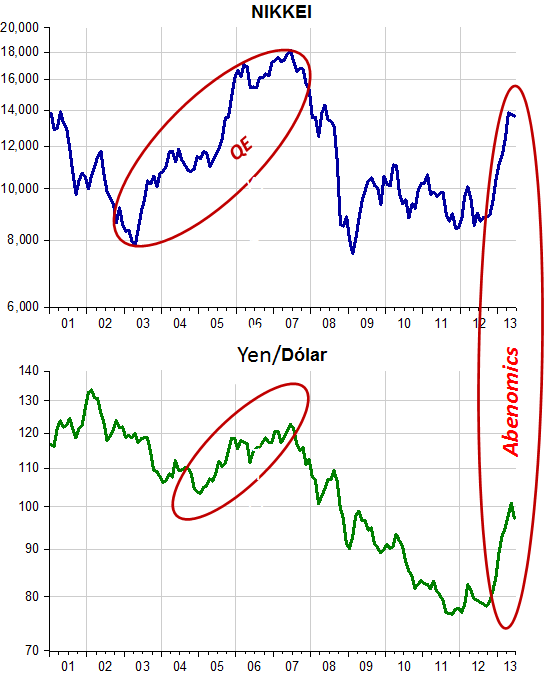 The charts below illustrate the parallels. Note that in the 1930s the effort made to get the economy back to trend was much greater. Today we seem ‘content’ with what we have and even call it the “new normal”! If this forecast is broadly accurate, then monetary policy will have to reverse course in the not-too-distant future and begin to remove the massive amount of accommodation it has supplied to the economy. Failure to do so in a timely manner could have serious consequences for inflation and economic stability in the future. To avoid this outcome, the Fed must confront at least two challenges. The first is selecting the appropriate time to begin unwinding the accommodation. The second is how to use the available tools to move monetary policy toward a more neutral stance over time. The problem is that expansionary monetary policy by the Fed and by central banks around the world is creating incipient inflationary pressure which is already manifest in rising commodity prices and in headline inflation in both emerging and some advanced countries. Both the record of economic history and recent empirical work suggests that we may be in for a significant run up of global and U.S. inflation in the not too distant future. Maybe a bit more than 9 quarters does not qualify as “not too distant future” but let´s see what happened to inflation since those ominous words were pronounced. Have they learned from experience? Maybe Michael Bordo has because I couldn´t link him to “inflation risk” searches since. But that´s not the case for Plosser. His name is almost synonymous with “inflation risk”!